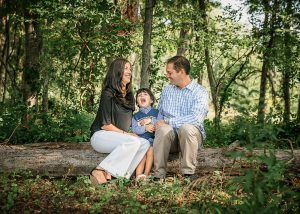 What do you do when you want beautiful Fall family pictures taken, but you have a very playful 6-year-old who only wants to have fun? Well, you make your family photography session a fun-filled exploration of the woods and river! We were so blessed to have gorgeous weather and leaves still on the trees when we did this session. It made for a wonderful Fall family walk in the trees. Momma got a chance to steal a nose tickle from her adorable daughter as the sun set. Daddy, every little girl’s hero, was so pleased with this moment he made sure to catch my eye so that I wouldn’t miss this shot. His little girl was showing him how the leaves crinkled when you ripped them, and he was just loving every second of their private minute together. And then we all needed a silly-break, so what could be more fun than trying to jump as high as you can. I was down at the bottom of the hill, so you can’t see just how much air they really got. But they did this about 5 times, and by the end, they were all laughing. Such a cutie, this one! I always try to get one serious, or soulful, image of a child. I had her close her eyes and relax and she opened them almost every time in hysterics. But this one second, I caught her being angelic. We often marvel over the tiny hands and feet of a baby, but forget to take note of what they look like as our children grow up. Her hands are truly in between that stage of a little girl and awoman, with the dirt of childhood play and the decoration of a blossoming young lady. Often times, parents aren’t so interested in getting that photo of them without their children. They have that wedding photo to look back on, right? But its images like this that mean so much to our children when they are all grown up. It allows them to look back and rekindle the memory they have of their parents while they were growing up. We couldn’t resist taking some time to play in the fallen leaves while we were out there. Little Miss was having so much fun she didn’t want to go home. We shot right up until the sunset, which is a huge challenge considering that a camera works based on light! But I was able to create this sunset silhouette for the family, which I love. As of right now, I am completely booked up for the remainder of the year. I have begun taking bookings for family sessions beginning in May, though. So if you want to get pictures of your family in the glory of spring flowers, contact me today!